To have Apple Front Row show and play videos inside of an iso file, first mount the iso file then make links to the video files inside of the iso, within your Movies folder. This can be useful for example when you have a season of television episodes of House MD in a single ISO disc image somewhere on your Mac. In my case the iso file disc image was named 20071107_170514 when it was created. Your mounted iso volume will be named differently. Create symbolic links to the video files within your Movies folder using the Terminal. Afterwards the videos will show up in Front Row like any other video or movie and you don’t have to copy the files out, saving disk space. /Volumes/20071107_170514 is the mounted iso volume. Change 20071107_170514 to whatever your iso volume is named. 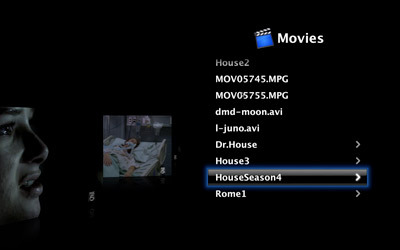 ~/Movies/HouseSeason4 is the directory where the videos will appear in Front Row. Since Apple Front Row automatically searches through your Movies folder for videos, making a subdirectory underneath Movies is an ideal spot. These symbolic links will appear like any other video file and Front Row will browse and play these files as if they were actually located in your Movies folder. Start Front Row by hitting ⌘+⎋ (Command Key and Escape) or hitting the Menu button on your Apple remote. Go into the Movies folder and you should see the folder you created in Step 2. Go into that folder and you should see the video files that were inside the iso disc image file. From here you should be able to play the video files that are inside the iso, without having to copy the files out to your Movies folder and taking up twice the disk space. Any volumes that you mount will be unmounted automatically when you reboot. Since the symbolic links within your Movies folder aren’t the actual video files themselves, they need the mounted iso volume to work. After rebooting, remember to remount your iso disc image by double clicking on it before looking for videos inside it within Front Row. But how do you get Front Row to play a DVD ISO? Double click the .iso within Finder, which mounts the file. Then create a directory within Movies folder, named appropriately for your DVD ISO content. Within that newly create folder, create a symbolic link to the VIDEO_TS folder of your mounted ISO (which should be within /Volumes/ somewhere). After that, Front Row should be able to find and play the ISO within the Movies folder. I had to mount the root ISO directory as opposed to the VIDEO_TS directory. But after that it worked great. Thanks! What if you’ve got a ton of .iso files on a network server? Is there a way for Front Page to handle mounting them? Or do they need to be manually mounted, one at a time, in order for it to work? if you have a ton of .iso movies on a network server, check out XBMC (XB Media Center) – I’ve played around with a lot of apps, and I really like this one – platform independent – works great with mac and pc.